After three preliminary rounds and one exhausting semi-final, the sixth annual The Woodlands Idol came to an exciting – albeit sometimes confusing – end. The finals had a new MC, Kelly Williams of YourTown TV; she did a great job, but it was also a little obvious she wasn’t as comfortable in front of the crowd as her predecessor. There was also a forty-minute delay due to circumstances beyond anyone’s control – the uncontested ‘most beautiful’ judge, Dana Tyson of Sunny 99.1, suffered a minor medical emergency and wasn’t able to be there – so we were in a bit of a holding pattern until Robert Bell could make it to Papa’s and fill her shoes. And what would a night fraught with tension be without one or two technical glitches with the music? Once the contest finally got started, Jessi Cowart (#1) was up first with Reba’s “Fancy.” Maybe it was just pure nervousness, or perhaps it was because she had to be first, but she did miss a cue early on in the tune. She recovered well, though, and finished the tune strongly. Next up was Zachary Jones (#2), who, talk about missing cues, really seemed to struggle with Matchbox 20’s “If You’re Gone,” first rushing the chorus and then missing several cues throughout the remainder of the song. After the first two contestants, however, missed cues quickly became a thing of the past when Jon Sheptock (#3) gave a perfect performance of Michael Bublé’s “Home,” I only wish his vocal volume could have been adjusted a bit higher than the background music; it was difficult to hear him clearly at the back of the room. The next contestant was Morgan McKay (#4), and her fearless performance of Carrie Underwood’s “Good Girl,” which warranted a lot of audience participation. There was a hiccup of some sort with Timothy Blair’s song choice, so we skipped ahead to Jordan Burmeister (#6), who took the change-up in stride like a pro. Though she started a little on the timid side, by the ending ‘for you are mine,’ of Etta James’ “At Last,” everyone in the room wanted to be hers. Problem sorted, Timothy Blair (#5) was able to go next, selecting yet another classic from the seventies with Brook Benton’s “Rainy Night In Georgia” and did as well as I expected; with little variety in his song selections, there’s little variety in his performances. This of course can help or hurt a contestant, depending on the whims of the judges. Daryl Bullinger (#7) Country-crooned “I Can’t Love You Back” by Easton Corbin with so much conviction I think every woman in the place wishing he’d give it a try. Breaking that spell – in a good way, but still – was Niki Uzell (#8) who rocked Gretchen Wilson’s “All Jacked Up,” though again, it would have been better if her vocals could have been at a better volume level compared to the background music. Finishing out the first half of the evening was Heather Wiley (#9), who took on Adele’s “Rolling In the Deep” while giving it a bit of a Country-twang. I didn’t think it really worked for her, though, and the result was less-than-perfect, with the higher, longer notes getting missed. Finally, gamely battling a chest cold, Jake Muck (#10) gave us his rendition of Mario’s “Let Me Love You,” and maybe it was the cold, but I really started to notice how very ‘boy band’ and nasally Jake sounded. We took a bit of a break to let everyone catch their breath and stretch their legs, then we were right back into the competition. Each contestant was now up for what would be their final attempt to win over the judges and be selected as this year’s The Woodlands Idol. Starting us off again was Jessi Cowart, who seemed much more relaxed this second time around and did a great job with Janis Joplin’s “Me and Bobby McGee.” Written by Johnny Cash and Charlie Williams, the tune has a decidedly country-rock feel to it, and Jessi brought that into her performance beautifully. Sticking with that country feel, Zachary Jones covered Tim McGraw’s “Down on the Farm” next, and it just seemed to me that he didn’t get after it with as much enthusiasm as some of his earlier performances. The whole thing seemed a little too level – too single-noted. Since she’d shown so much promise with such a range of vocals and variety of song types, I was really pulling for little Jordan Burmeister. I’m going out on a limb, here – I hope she doesn’t mind that I keep calling her little. I mean, she is a full-grown, married woman, after all. She’s just very short and adorable (I could eat her up!). Anyway, she belted out Adele’s “Rollin’ In The Deep” with fantastic enthusiasm, and was always aware of where the microphone was in relation to her mouth, careful to pull back on the louder, carried notes and to bring it back in for the softer, quicker ones. Daryl was up once more and the word that sticks out at me from my notes was that his performance was very sweet. He sang Brooks & Dunn’s “Believe,” and if you’re not familiar (as I wasn’t) it’s a great storybook song about ‘Old Man Wrigley,’ the love and loss he experienced and how he passed words of wisdom on to the young man that was his neighbor. Niki Uzell belted out Carrie Underwood’s “I Told You So” a little too strongly – it just wasn’t her best performance of the contest. Then Heather Wiley gave us her version of Alicia Keys’ “If I Ain’t Got You,” but it lacked the deep, moving soul that I’m accustomed to hearing in Alicia Keys’ music. Finally, Jake Muck closed out the competition with what I had hoped would be a great take on a relatively new song, Alex Clare’s “Too Close,” but again, Jake was a bit nasally and seemed to be attempting to sing the song at a higher register or key than what the music called for. With that, the judges’ scores were tallied up, and though there were winners announced that night, a review of the scores later revealed a tie and some shuffling had to be done. In the end, Daryl Bullinger came in third place, Zachary Jones and Morgan McKay tied for second place and the title of 6th Annual The Woodlands Idol went to Jon Sheptock. Some of those were my choices, and some weren’t, but like fantasy football, my opinions and my choices don’t matter, only the official choices of the judges do – and they made some good ones. 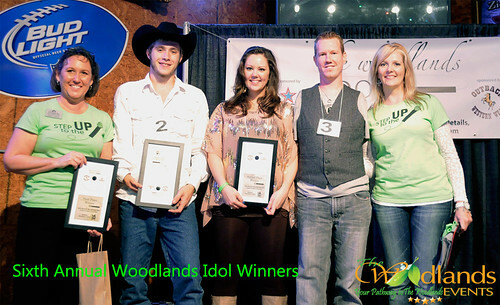 Now I just can’t wait for next year, where I hope to see some returning favorites and some fresh talent try their hand at becoming the next The Woodlands Idol! For pictures of the finals event, check out our Flikr Album.